The eeriest experience we offer... Hop on board the creepiest coach in London, and let the cadaverous conductor terrify and thrill you with London's most terrifying tales! 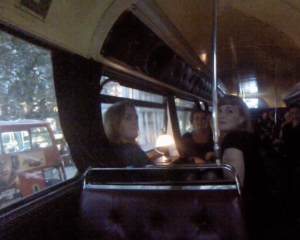 Take a terrifying tour of London on the Ghost Bus! You can expect devilish drivers, creepy conductors and petrified passengers, as you tour London's more supernatural sights. The fright bus is a London tour with a twist, taking you to haunted spots and burial grounds, and revealing some skeletons in our capital's closet! The bus itself is a genuine coffin coach, originally used in the 19th Century as a sort of funeral vehicle that could transport the coffin, pallbearers, and 50 mourners! Your London Ghost Tour will be as funny as it is creepy, and is a great group or family activity. 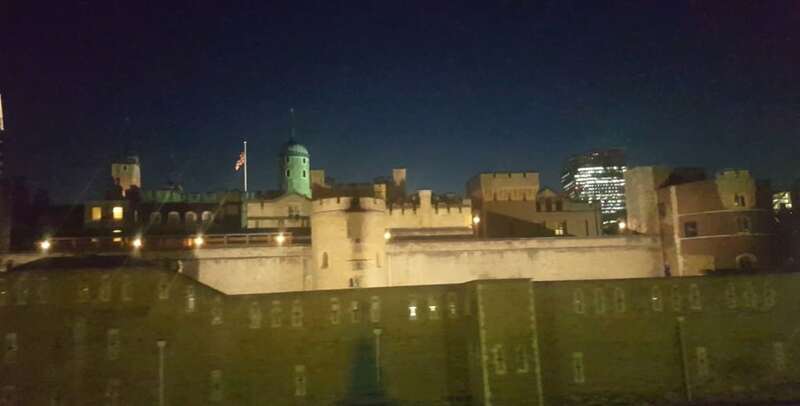 The ghost tour of London runs all year round, and is subject to seasonal demand. Additional tours are put on in October. *Times may vary throughout the year. Unfortunately the design of the bus means that it cannot be made wheelchair accessible. This is not suitable for young children. Seats on the lower deck of the bus can be reserved in advance for those with mobility concerns. Please enquire when booking. 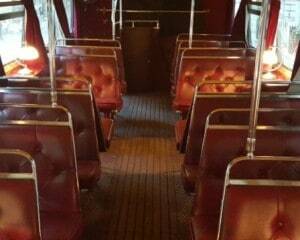 The London Ghost Bus Tour lasts for 1 hour and 15 minutes, and is non-stop. Participants: The Ghost Tour London For 2 is for 2 participants. This is definitely one to participate in - not suitable for spectators! The London Ghost Tour is only affected by seriously heavy snow. This was a really fun and unusual experience. It is more of a comedy-horror play than a sightseeing tour, the actors were hilarious and the story they told was scary! Very enjoyable, would recommend. 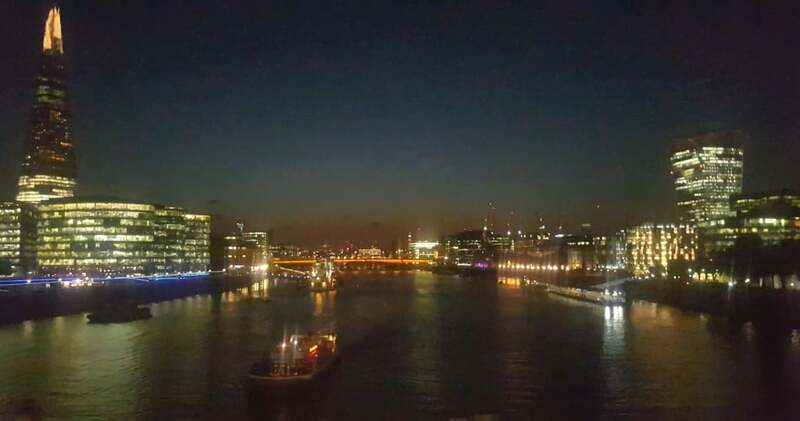 On Thursday 10th September, Rosie and I headed into London for a tour of the city, however this wasn’t your typical walking tour of London… This was a tour with a twist! Arriving at Northumberland Avenue, the dark skies began to creep in on the daylight creating a foreboding atmosphere, the perfect setting for a ghost bus tour. That’s right, we were about to take part on an eerie tour of London, visiting some of the cities most haunted areas, and unveiling some of its deepest and darkest secrets! The unusual black ghost bus was easy to spot, standing out like a sore thumb compared to the typical red double decker buses of London. As we waited to board the bus we quickly realised this wasn’t going to be a standard capital city tour, noting the name of the bus Trafalgar Scare, Notting Hell, and the skulls lining the windows. Being the massive scaredy-cat that I am, it’s fair to say I was pretty apprehensive about what lay in store. As we stepped on board we were greeted by our creepy conductor and ushered upstairs to take our seats. 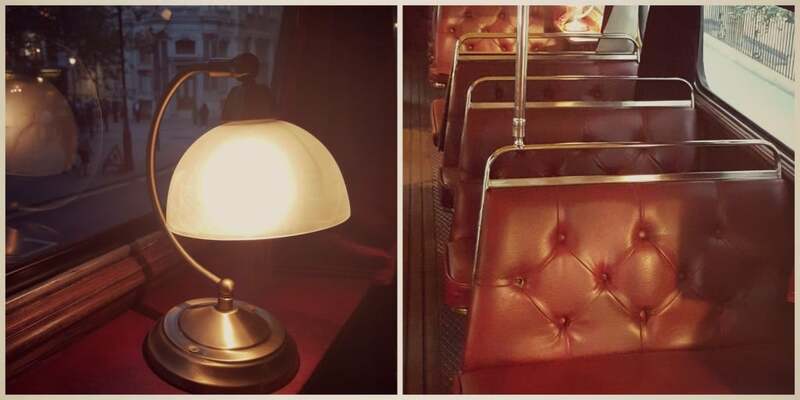 The décor of the bus had an aged feel to it, and after finding out that it was once used as a carcass coach back in the 19th century to transport the deceased to their final resting place, I was left feeling slightly on edge. The tour began by taking us around central London, passing some of the city’s most famous landmarks, including Trafalgar Square and 10 Downing Street. We learnt all about those that fought in the historic battle of Trafalgar in 1805, as well as the ghosts that now haunt Downing Street! As we discovered more and more about the chilling history of London, you could notice the uneasiness growing amongst the passengers, at which point some unusual activity started to occur on the bus. This is when the twist was revealed, and we found out that we were actually on a slightly more interactive tour than we had first anticipated. It turns out the tour guides are also actors, telling you the stories of London while creating a story of their own – which you are part of! 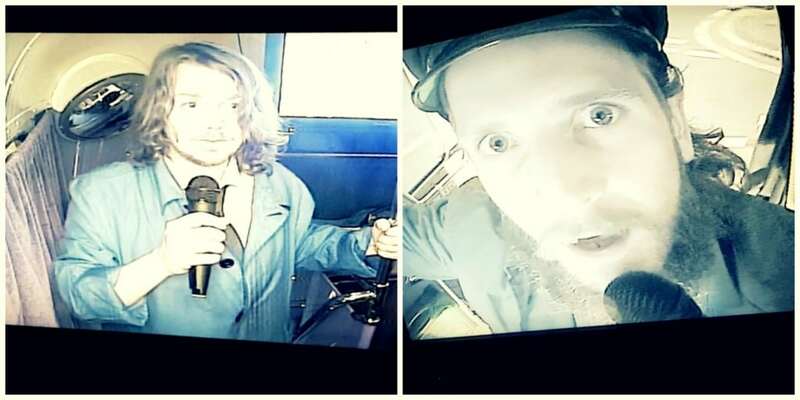 Whilst the actors provide hilarity, they also create fear amongst the passengers, to the point where you are left biting your nails as you are plunged into darkness, or making you jump by using loud sound effects. I could let you in on all the secrets, but what fun would that be if there was no element of surprise? So… I’m not going to! If you want to experience the same adrenaline rush and fear that I did, whilst also having a good laugh then I would highly recommend you book yourself a space on one of their tours and discovers the surprises for yourself. 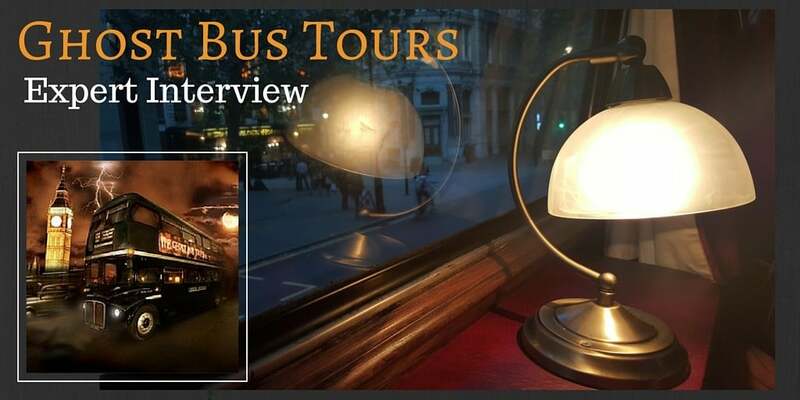 Expert Interview with Ghost Bus Tours! Thanks for taking the time to speak with us! 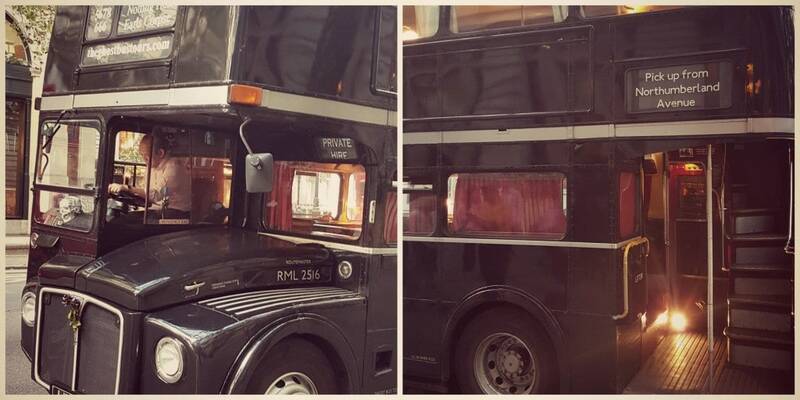 Can you tell us a little bit about Ghost Bus Tours and how it all started? The Ghost Bus Tours is essentially a theatrical sightseeing tour. It’s a comedy horror show while you see the sights! There are a few horror attractions around, so we decided to create an attraction for the whole family that incorporates elements of sightseeing. We show you all the places we’re telling stories about. It was created by professional actors and comedians as a fun way to experience the city at night. Sounds really interesting! So, what makes this London tour different and exciting for your customers? The big difference is that we combine theatre with a tour of London. We show you all the famous sites that you see on other tours, but we also have actors on board performing a show. Our actors are all professionally trained and are also comedians, so the audience has a lot of fun whilst being scared! We also have a state of the art sound system and screens on the bus to create a fully immersive audio visual experience. So we can enjoy a show whilst being whisked around sightseeing on a bus? Sounds awesome! What are the different tours you offer, and is there a favourite amongst your customers? The main show we have been running since the beginning is the London Ghost Bus Tour. We also have a Ghost Bus Tour in Edinburgh, and one in York. We are currently in production of a New York Ghost Bus Tour as well! Alongside that we have a daytime tour called The Time Tour. This one is not about ghosts, it’s a science fiction time travel tour where you are taken around London by Professor Quantum, a Doctor Who type with some rather eccentric additions added in as well. I wouldn’t say that there is a favourite amongst our customers, all our tours have been very positively reviewed and we have received the TripAdvisor certificate of excellence for the last two years. C ongratulations, sounds like you really deserve it! The Ghost tour looks frightening… Is it suitable for everyone? The Ghost Bus Tours are absolutely suitable for everyone. It is primarily a comedy show with elements of horror. There are some scary moments (which I won’t go into here so as to keep the surprise! ), but it is designed to be accessible to a family audience. Of course, we tailor the show to the audience; if there are no small children on board then we do increase the scariness and pull out all the scary stops! It all depends on the audience, but we make sure that each show is designed to appeal to the specific audience on board. Finally, have you got any exclusive news you would like to share with us? Our main exclusive news is the addition of a Ghost Bus Tour in New York! We are currently working on it and are hoping to have it up and running for Christmas. Watch this space! How exciting! We will definitely be keeping a look out for your venture across the pond. Thanks very much for talking with us, your tour experiences sound fantastic! 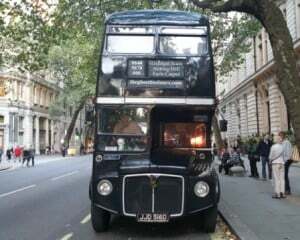 The Ghost Bus Tours currently operate in London, York and Edinburgh. These tours offer an unusual and creepy night out with friends or family, perfect for a Halloween treat. They certainly are tours with a difference! We also provide vouchers for The Time Tour experience here.